Your quilt top will be returned to you in the same condition that it was received; so, if the top wasn't square when you brought it, it may not lay flat when it is quilted. If the borders were ruffled, then there may be fullness or tucks in your finished quilt top. Take the time with your quilt back as you did with your top to ensure a successful project. What is my greatest quilting challenge?? Quilt backs that are not square. Quilt top should be square. Ensure your borders have been attached correctly. If borders are too small the center of the quilt may sag, if the borders are too large there may be puckers or fullness in the borders of the quilt. Do not pin or baste your top/back/batt together. 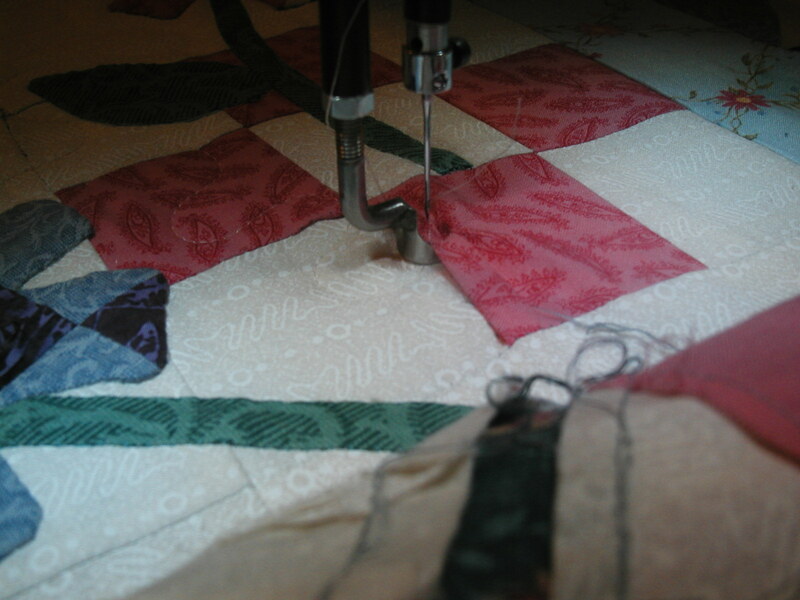 Check the quilt top for seam breaks as these can cause tearing when the top is stretched on the rollers. This is what happens when the hopping foot gets caught in a seam that was not sewn properly. Luckily,I was able to remove the stitches without causing tearing to the quilt - this is not always so! Please leave any embellishing (buttons, embroidery, 3D flowers, etc) to be done until after the piece has been quilted. The hopping foot on the long arm can cause buttons to break or even get caught in embellishing. If there are pleats in your piecing before quilting they will still be there after the quilt top has been quilted. The quilt back and quilt batt MUST be a minimum of 6" larger than the quilt top in both length and width. If the back and batt are not the minimum of 6", there is no guarantee that there will not be shrinkage and you may have to trim your quilt. Quilt backs will be centered by direction of customer, or by the best possible direction. If your back has a head and foot, please identify. Quilt back should be square and pressed. Press all seams on your quilt back open, remove selveges. If your quilt back has a label that needs to positioned in a certain way, please identify. If this has not been identified, the back will be positioned with the label in the bottom left or right corner, or by the best possible direction of the quilt back. Use of sheets is strongly discouraged as a quilt back. Most cause poor tension and constant thread breakage because of the dense weave of the fabric. Broken needles also result from the stiffness of the sheet fabric, as well broken needles cause holes in the fabric. Sheets are also rarely square when you take them out of the package and this can cause the back to become distorted. Creating a back from various stash pieces may seem like a good idea, but if you do not create this "back quilt" with as much care and attention as the front you will have problems with sagging and distortion. These types of backs MUST be square. I cannot guarantee that there will not be puckers, but of course I will do my best! Try NOT to have a centre panel with borders as a back. This is very difficult to center exactly as the top and back advance on rollers differently. Again, I will do my best! What is the best backing?? In my opinion, one solid piece of fabric is the best, and since there are 90" and 104"-108" fabrics available it is possible to obtain these. If not, then a 3 seamed backing is the best I have used. Choose 100% cotton for backing fabric. Polyester/cotton and 100% Polyester stretch differently than cotton and cause cause tucks and puckering. Choose 100% cotton for batting. Polyester batting can pill and encourage bearding, and cause tucks and puckering. I do not quilt with high loft polyester batting ( no explanation - it's ugly :). I do not guarantee there will not be puckers or tucks when using any type of polyester batting. I prefer to use cotton thread for all my quilting; however, there are times when a rayon or metallic may be used. This, of course, will be at the direction of the customer and will be discussed before the project has been quilted. I use Wonderfil cotton thread, Signature Cotton Thread and Genziana Cotton Thread primarily. I prefer to use the same color thread in the top and in the bobbin when quilting a project; however there may be times when this is not possible especially if the quilt top and the quilt back are very different colors. If a darker color is used on the top and a lighter color in the bobbin, sometimes there can be light dots showing through the top of the quilt. This can happen when there are multiple thread changes within a project, for instance when there are red blocks and white setting triangles. I usually try to match the bobbin thread to the top color of the quilt - this may mean that the design on the back of the quilt will show up a little more. This just means that if you send a light quilt top with a dark backing, you may end up with some thread art on the back of the quilt - think of it as a reversible quilt! If there are multiple thread changes required, please take this into account when choosing a backing fabric. A medium print works much better than a solid. Divide by three and this is the measurement of the side borders. To attach the borders, divide the border in half and match to the middle of the side, pin from the middle out and sew. Repeat this process with the top and bottom of the quilt.